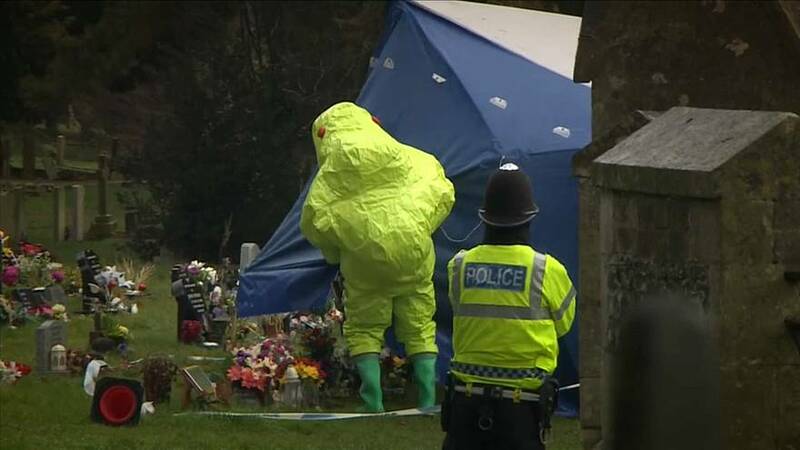 As the investigation into the nerve agent attack on former Russian spy Sergei Skripal and his daughter Yulia gathers pace, experts in full hazmat suits set up tents around the grave of Skripal’s wife at Salisbury cemetery and the memorial for their son who died last year. Detectives are trying to discover how the toxin was administered and where it was manufactured. Meanwhile, Russia has fiercely rejected suggestions that it was involved in the attempted murder. Russian Foreign Minister Sergei Lavrov says there isn't ' "a single concrete fact" about what happened and accused the UK of "fanning hysteria". Earlier members of the armed forces removed a number of vehicles and objects from the scene including ambulances that may have been contaminated while assisting the victims.